More stickers!!! I will be doing a series/project of pokemon ones of lots of different themes, including type, and as shown above: water! So cute!! 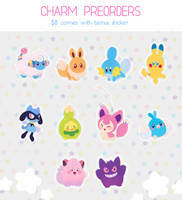 The pinks complement all the blue so well, and that is possibly the most adorable Azumarill I've ever seen ;_; <3 Lovely!